Dispenses 600 C-Fold, 800 multi-fold or 1100 single-fold towels. 7 gal. (26.5 L) stainless steel waste receptacle. Adjustable guide provided to allow dispensing of single-fold, multi-fold or C-fold paper towels. Door held closed with two (2) tumbler locks. Paper towels are manually withdrawn through dispensing slot. A towel adapter ensures that towels feed properly until depleted. Unit will continue to feed properly when reloaded with a partial load in place. 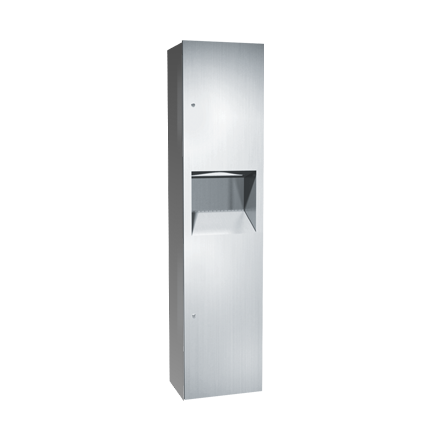 Refill dispenser by unlocking door and replacing towels for an empty or partially empty unit. Dispenser supply is replenished and waste container is emptied manually. Locking full-face door over compartments prevents unauthorized access or removal.